The American economy, bolstered by a run of decent employment numbers and a party-in-the-USA third-quarter GDP pop, is finally beginning to show signs of health. While this good news didn't arrive in time to help Democrats retain control of the Senate, it still technically qualifies as good news, because "the economy" is actually not just a thing that determines whether affluent politicians get to keep their seats. American taxpayers have endured much hardship since the 2008 financial crisis, and pretty much everybody, from career politicians to human beings, will be better off if the economy continues to improve. Speaking of "pretty much everybody": It's worth remembering as we head into the new year that anyone -- officeholders, pollsters, whoever thought it was a good idea to make a spaghetti sauce say "bae" -- anyone at all can make confident predictions about what the economy is or is not going to do. That doesn't mean we have to pay attention each time. Here, we offer a greatest-hits tour of economic forecasts that did not exactly pan out, with a gentle suggestion that in 2015 we leave this kind of thing to the actual economists. After President Barack Obama took office in 2009, a good way to die of cirrhosis would have been to take a shot of liquor every time the White House made mention of the dire economic circumstances they'd inherited. Because those were some dire circumstances indeed, as they reminded us, constantly. Yet at the same time, the administration strove to persuade the public that these Very Grim Realities were somehow going to be dispelled sooner rather than later. Christina Romer, then Obama's chief economist, got the ball rolling during the administration's first term by suggesting the fiscal stimulus package was going to keep the unemployment rate below 8 percent. This, the stimulus package did not do -- it was a moment of oracular straining that Romer would come to regret. Vice President Joe Biden, however, was right alongside Romer, claiming in February 2009 that the stimulus was going to "literally drop-kick us out of [the] recession" within 18 months. In a technical sense, the recession did end within that time frame, but not with anything like the momentum of a drop-kick, or even the regular kind of kick. Still, by June 2010, the White House had declared that "Recovery Summer" had arrived. The ensuing months, however, were more of a recovery bummer. (See, "bummer" rhymes with "summer," and... you get it.) Unemployment remained high, job growth was tepid and the alarming foreclosure crisis continued apace. Economists, meanwhile, were much more inclined to worry about the possibility of a double-dip recession than they were to sift through the whiplashing economic indicators looking for reliable signs of hope. And so in August 2010 -- Biden's original deadline for the drop-kicked end to our economic woes -- there came a New York Times op-ed from then-Treasury Secretary Timothy Geithner titled "Welcome To The Recovery." In it, Geithner touted a number of important, tangible gains, but also repeatedly emphasized that the work of revitalization was just getting underway. "We have a long way to go to address the fiscal trauma and damage across the country," he wrote, adding that "considerable challenges" still lay ahead. Good thing they didn't print those "Recovery Summer" beer cozies! Now, years later, we're starting to see signs of what was prematurely promised. In fact, as Steve Benen recently noted at MSNBC, the White House can take some cheeky satisfaction in the way it delivered on many economic promises faster and better than several of the people who sought to unseat Obama in the 2012 election. Mitt Romney promised to have the unemployment rate under 6 percent by 2016; Obama did it two years sooner. Tim Pawlenty said that the key to getting 5 percent GDP growth was to offer the wealthy some generous tax breaks; Obama raised those taxes and hit 5 percent anyway. And Newt Gingrich famously vowed that he'd get gas prices down to $2.50 per gallon (after predicting that Obama would bring America $10-a-gallon gas). The ability of presidents to affect gas prices is highly overrated, but if we're keeping score -- most states currently have prices lower than what Gingrich promised. Which brings us to our next point -- as little as you could rely on the White House for accurate economic predictions, the opposing side hasn't been much better. The Dow Jones Industrial Average is a highly overrated indicator of economic health, and I would not recommend that you assign it too much importance when trying to determine whether a nationwide economic recovery is afoot. Having said that, let's have a little fun with the fact that last week, the Dow closed above 16,000 for the first time ever. This is mainly worth noting because so many people have in recent years predicted the incipient demise of the stock market, as well as, like, the very concepts of money and ownership. In March 2009, for example, Michael Boskin -- a Stanford University economics professor and former economic adviser to President George H.W. 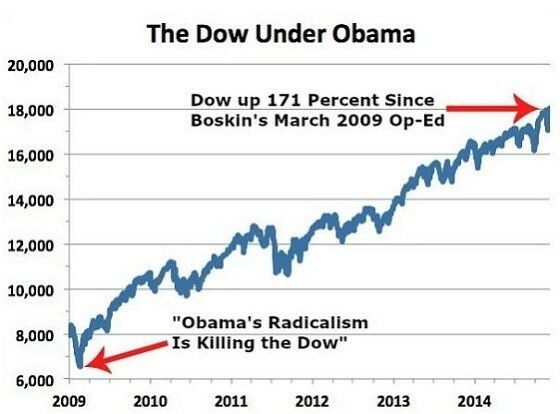 Bush -- wrote a piece for The Wall Street Journal called "Obama's Radicalism Is Killing The Dow." In this piece, Boskin claimed that Obama, for some reason, wanted to "change the foundation of American capitalism." This was an odd conclusion to reach from the mere fact that there were a handful of policy prescriptives that Boskin didn't support -- like imposing a cap-and-trade plan (which never materialized), reforming health care (which did happen, but not in the form of the government-provided universal health care option that Boskin seemed to believe was in the offing), and raising taxes on the wealthy (which came about somewhat by allowing some of the George W. Bush-era tax cuts to expire). Obama also didn't manage to make the cuts to earned benefit programs that Boskin called for in his column (though not for lack of trying). Overall, Boskin wrote a solid piece enumerating his preferred economic policies -- but as the White House didn't actually "radically re-engineer the market-based U.S. economy" after all, perhaps it would be good of him now to acknowledge that he should have rejected that thesis in favor of "Here is my conservative economic policy philippic, you guys." He never even got around to describing how all of this was going to "kill the Dow," which, again, has done great. Boskin was hardly alone in his weird Dow doomsaying. During a March 2010 episode of CNBC's "The Kudlow Report," Larry Kudlow and Jim Cramer batted around the idea that Obamacare would be a Dow-killer. KUDLOW: You are saying that Obamacare will topple the stock market. This is a huge issue. Let me get your first take. CRAMER: It is the single biggest impediment to the stock market going higher. And a lot of this has to do with what's not being talked about, with how it's going to be paid. And also to what it would do to small business formation. This bill is a disaster for both. As Media Matters was happy to note, the Dow finished up 43.91 points the day after the House of Representatives passed the Affordable Care Act. What's funny is that anyone interested in critiquing Obama on this issue already had plenty of material available. The slow pace of the recovery, coupled with the White House's habit of overpromising, meant there were more than enough opportunities to point out room for improvement. But often, Obama's critics depicted the economy as if they'd just come from their Young Adult Dystopian Literature class at the Learning Annex. It was not uncommon for people -- most of them in or adjacent to politics -- to suggest that the White House was bent on actually destroying the economy. Former U.S. Rep. Allen West (R-Fla.) asserted this as fact. Rep. Pete Session (R-Texas) insisted that Obama wanted to "inflict damage on the free enterprise system, if not... kill it," and also that Obama sought to "diminish employment and diminish stock prices" in order to permanently consolidate power. I don't actually understand that's supposed to work, but then again I do not do too much laudanum. It might be fun at this point just to pause and laugh at some people who've offered terrible economic advice to the Obama administration over the years. Go ahead and relive the memories of career pollsters Douglas E. Schoen and Patrick H. Caddell advising Obama not to seek re-election for the sake of the country. From the faltering economy to the burdensome deficit to our foreign policy struggles, America is suffering a widespread sense of crisis and anxiety about the future. Under these circumstances, Obama has the opportunity to seize the high ground and the imagination of the nation once again, and to galvanize the public for the hard decisions that must be made. The only way he can do so, though, is by putting national interests ahead of personal or political ones. Then proceed to journalist Michael Kinsley's bizarre 2013 assertion that Obama should give in to Republican demands to delay the implementation of the Affordable Care Act in return for a debt ceiling increase -- because that would somehow teach the Republicans a lesson. The media will no doubt call Obama weak because he gave in. So let them. Sticks and stones. Meanwhile, will the Republicans really take the past couple of weeks as a precedent and push him around on every issue that comes up? Highly unlikely. They are already getting most of the blame. They surely don’t look forward to trying to convince voters it was such a swell experience that they’re going to put us through it again and again. We've had some fun here, but make no mistake, these are still precarious economic times for most of the 99 percent. It's good that GDP growth is up, better still that unemployment is down. I suspect we're still a couple of years away from being able to fully evaluate whether the Affordable Care Act delivered on its promise to enroll more of America's uninsured while keeping health care costs manageable, but early signs are encouraging. That said, here are two things worth focusing on in the near future. 1. The quality of jobs. Always remember that while it's nice to see the U-4 unemployment rate come down, low unemployment is all for naught if American workers don't actually have quality jobs with decent pay and benefits. If the future of American employment is schlepping around an Amazon fulfillment center as a glorified temp, that's really no future at all. And for all the "innovation" in what we're euphemistically calling "the sharing economy," there's still a lag in critical labor rights for the people who perform the daily IRL work that makes "digital entrepreneurship" possible. 2. 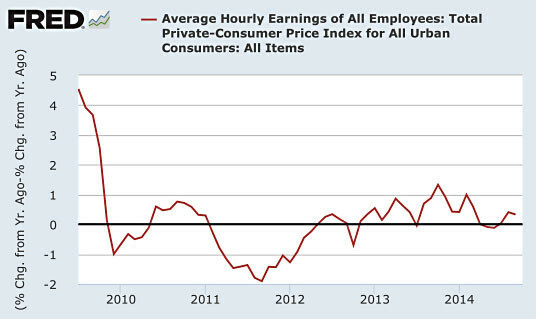 Wage growth, or the conspicuous lack thereof. 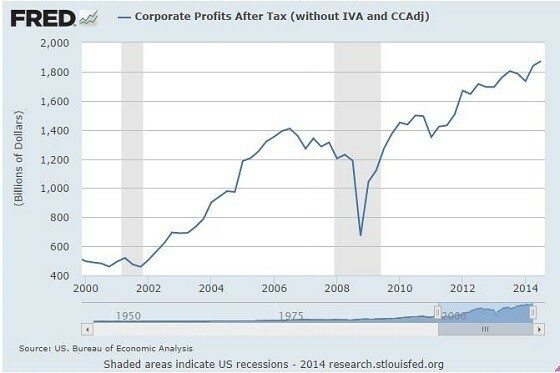 Via Mother Jones' Kevin Drum, this is the real recovery bummer: "This is the basic lay of the land. Yes, the economy is improving and jobs are becoming more plentiful. But most of us have seen our pay stagnate for four years and counting. That's one of the reasons the public mood remains so sour." I, personally, would venture that this isn't going to change anytime soon. But let me remind you: I am not an economist. And most of the people who will strive to convince you in 2015 that certain things are or are not going to happen will also not be economists. Politicians have their own reasons, obviously, for confidently telling the public that X, Y and Z are in the cards. A great thing we can do, next year and every year, is to keep in mind that just because someone is talking where you can hear them, it doesn't mean they know what they are talking about.